​Sevendust’s triumphant return to Australia marks the first shows on Aussie soil in six years and Atlanta’s brutal hard rock kings are back as heavy as ever. Sevendust kicked off their illustrious career with an untouchable string of three gold albums, beginning with their self-titled 1997 debut and continuing with Home in 1999 and Animosity in 2001. Along the way, they’ve sold out shows everywhere and given unforgettable performances at the likes of Rock On The Range, Woodstock and OZZfest. However, the new chapter starts now. The blistering new album Kill The Flaw has received some of the best reviews of the band’s careers, displaying a re-invigouration of creativity and signaling a rejuvenated take-no-prisoners stance akin to that initial three album burst of mayhem. It’s in the live arena that the full force of Sevendust becomes truly apparent. Dynamically vibrant vocals, as robust as they are raw, tower over bombastic drums, buoyant bass groove and Sevendust’s trademark grinding, gut level riffs, contrasting striking melodic sense with sledgehammer aggression. On stage, the group have never been in finer form - Lajon Witherspoon vocals, Clint Lowery lead guitar, John Connolly guitar, Vince Hornsby bass, and Morgan Rose drums - deliver a massive sound perfectly suited to the absolute turmoil ensuing amongst the maelstrom of exuberant fans in front of the stage. 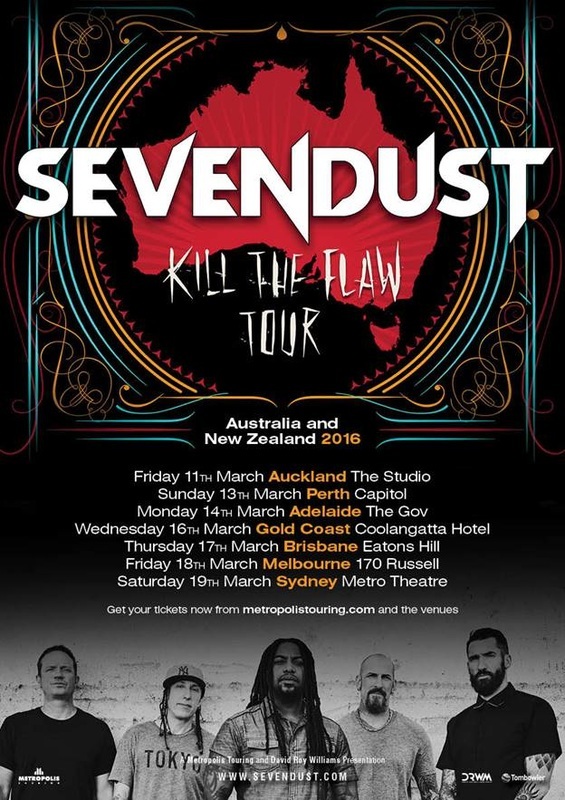 It’s been a long wait but Australian fans finally get the opportunity to participate in the bedlam this summer when Sevendust hit our shores, starting out in Perth and culminating in what are sure to be full-on contenders for gigs of the year in Melbourne and Sydney. Limited numbers of VIP tickets will be available, affording the unique opportunity to meet the band and be photographed with them, so be quick and get your tickets now before they are gone!